More than 2,000 students graduated during Wright State’s 77th commencement ceremony on April 27 in the Wright State Nutter Center. Spring commencement includes 2,063 applications for degrees: 49 associate degrees, 1,302 bachelor’s degrees, 583 master’s and 129 doctoral degrees, including 107 medical degrees. 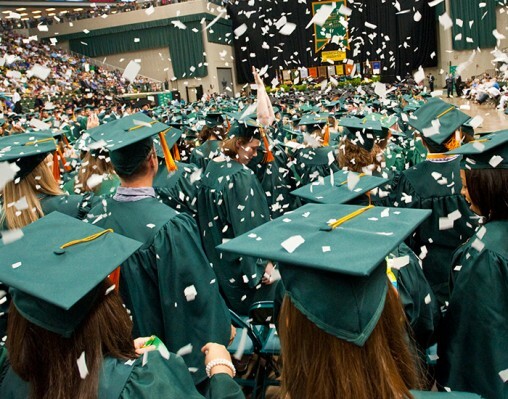 The class of 2013 gives Wright State more than 100,000 total graduates. Wright State President David R. Hopkins challenged the graduating class to use their talents and skills to improve the world. “Will you be creative and innovative or just follow the status quo?” he asked. Hopkins encouraged graduates to learn the difference between making a living and making a life. Wright State also awarded an honorary Doctor of Humane Letters degree to Janet Wolfenbarger, the first female four-star general in the U.S. Air Force and commander of the Air Force Materiel Command at Wright-Patterson Air Force Base. Wolfenbarger, who graduated from Beavercreek High School, was part of the first Air Force Academy class to include women. She encouraged the graduates to persevere through challenges and adversity. “No matter who you are or where you are, embrace every challenge before you,” she said. Many students wore purple in memory of Kristen Fisher, who was pursuing her master’s degree in English when she lost her battle with breast cancer. Here are four inspiring stories from members of the class of 2013. 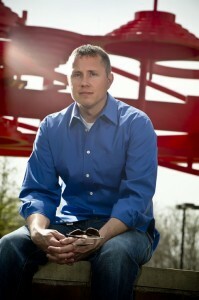 Eastman Klepper, an Iraqi war veteran, spent 11 years in the Marine Corps Reserves before enrolling at Wright State. Eastman Klepper was a Marine Corps veteran stuck in a middle-management job when he realized he needed a change. After graduating from Wayne High School in Huber Heights, Ohio, in 1996, he went to The Citadel, but left college after his first year. More than a decade later, he said, “It was apparent I wasn’t going any further” in his career. After the post-9/11 GI Bill was passed, Klepper enrolled at Wright State, majoring in history and minoring in Russian studies. Part of the University Honors Program, he completed his B.A. in three years. Klepper and his wife have been married for 10 years, and he has three stepchildren, ages 20, 17 and 14. During his first year at Wright State, he continued to work at Pepsi. He then worked part-time at night for FedEx during the last two years. “I knew eventually, somewhere down the road, I could say, ‘this will pay off, somehow, someway,’” he said. He admits to thinking at times he would never finish college. What comes next is graduate school. Klepper will pursue a master’s in Russian, East European and Eurasian studies at the University of Illinois at Urbana-Champaign, where he received a full fellowship to pay for his studies and travel to do research. After graduate school, he hopes to work as an analyst specializing in Russian military and foreign policy for a defense or intelligence agency or a nongovernment organization. 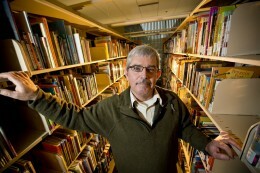 Since high school, he’s had a fascination with history and military history, particularly World War II. His grandfather fought in Patton’s 3rd Army. Klepper joined the Marine Corps in 1999, trained as a crewman on an Abrams tank and spent the next 11 years in the Marine Corps Reserves. In January 2003, he deployed to Kuwait and crossed into Iraq two months later at the start of the war. Klepper served in Iraq for several months and returned to the United States that summer. “The Marine Corps gave me the discipline and the focus to carry on in a college environment,” he said. 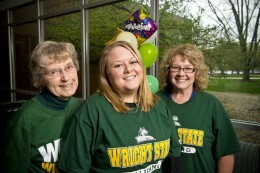 Amber Justice is the third woman from her family to earn a degree from Wright State. Her mother, Ann Stalter, received a BSN and MSN, and her grandmother Mary Ann Stalter received a B.A. in elementary education and learning disabilities. When she graduates this week, Amber Justice will be the third woman from her family to earn a degree from Wright State and the first on her father’s side to graduate from college. Her mother, Ann Stalter, received her BSN in 1983 and her MSN in 1994. Her grandmother Mary Ann Stalter received a B.A. in elementary education and learning disabilities in 1975. Mary Ann Stalter taught for 33 years. Both Ann and Mary Ann Stalter said their family has long emphasized the importance of education. “We’re really proud of Amber. We’re proud because she is number three for us and she’s my first,” said Ann Stalter, Ph.D., RN, associate professor, RN-to-BSN and Lake campus director at the Wright State College of Nursing and Health. Justice said she always planned to attend Wright State, in part because of her family’s strong connections to the university. She was also familiar with the university because as a child she would sometimes come to work with her mother. “I already knew the campus,” Justice said. She earned a B.S. in organizational leadership, and plans to remain at Wright State to pursue a master’s degree in clinical mental health counseling in the College of Education and Human Services (CEHS). Justice was inspired to enroll in the clinical mental health counseling program after taking a course with Diane Frey, Ph.D., adjunct instructor in CEHS who also has her own practice. “After hearing her talk about her day-to-day experiences, it just solidified that I knew I wanted to do it,” Justice said. Jerry Dooley, a 57-year-old grandfather and former business owner, started working on his college degree in 1976. Jerry Dooley, a 57-year-old grandfather and former business owner, says he has gained new perspectives as a result of the service-learning classes at Wright State. As part of the class, Dooley volunteered at St. Vincent de Paul, where he tutored elementary students. The class gave him a new outlook about community engagement. Volunteering in your community, he said, can make you happier and healthier. Although he’s completed the class and is set to graduate, Dooley continues to volunteer at St. Vincent. “After I went there for 11 weeks, I couldn’t stop going,” he said. For more than 30 years, Dooley owned a retail garden center and landscape contracting business in Springfield, Ohio. After selling the business in 2006, he started working at Wright-Patterson Air Force Base in the civil engineering department. In 2008, he completed his associate degree in nursery management at Clark State Community College. He began working toward the degree in 1976, but had to put it on hold because of the demands of his business and family. Dooley and his wife have four children and five grandchildren. After completing his associate degree, he enrolled in the Organizational Leadership program in the College of Education and Human Services at Wright State. Dooley said that while he’s enjoyed his classes, he most appreciates the relationships he’s developed with his classmates and faculty. These relationships, Dooley said, have helped him to question and better develop his own perspectives and ideas. After graduation, Dooley hopes to explore the options and opportunities his new B.S. degree presents. Wright State, he said, has helped him to be more understanding and improve his communications skills. Mackenzie Buschur is among the first class of graduates of the new bachelor’s degree in Technical and Applied Studies from Wright State’s Lake Campus. Mackenzie Buschur grew up on her family dairy farm in Darke County. She first started working on the farm in her early teens; her first job was to bring cows into the barn for milking. By 16, she started milking the cows herself. Buschur is among the first class of graduates of the new bachelor’s degree in Technical and Applied Studies (BTAS) from Wright State’s Lake Campus in Celina, Ohio. This spring, six students will receive the BTAS degree, three with the agriculture concentration and three with the graphics concentration. The degree offers a mixture of general education courses, broad-based business classes and specialized training in fields of local employment, including agriculture, commerce and graphic design. Buschur is graduating at age 20. She participated in Post-Secondary Enrollment Options program as a student at Versailles High School, enabling her start college as a sophomore. In addition to taking classes, Buschur works full-time at Minton Veterinary Services, making medicine for pigs. She said she has been able to work full-time while in college because many of her agriculture classes are held in the evenings. 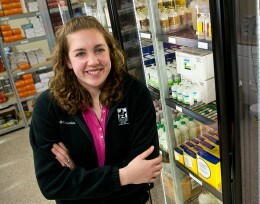 The BTAS program, Buschur said, helped make her well-rounded and move beyond what she had learned on the family farm. “I know about cows,” she said, “but I didn’t know about chickens or agronomy.” She also picked up other skills, made connections and learned she liked the areas of human resources and employee relations. The program also allowed Buschur to stay close to home, work full-time and afford college. “It was the perfect solution for me,” she said.